I listened to the latest Here’s The Thing with Alec Baldwin podcast. The episode featured Joe Jackson. The interview reminded me of how much I love Jackson’s Night And Day. I was inspired to give the LP a spin and to add it to my Hall Of Fame. Jackson burst on to the scene with an amazing hit single in 1979: “Is She Really Going Out with Him?” from his debut Look Sharp. Jackson was one of the founders of what became known as New Wave (my definition of New Wave is punk rock played by musicians). I was a modest fan of his debut, missed his second, but went positively nuts over his third album Beat Crazy, which was a commercial failure. That album was pop punk, New Wave and ska. What do you do for a commercial failure’s encore? Why an album of 1940s swing and jump blues songs – stuff associated with Louis Jordan and Cab Calloway. It was another flop, but foreshadowed the retro swing revival by about ten years. Therefore, it was quite a shock that Joe’s next album, 1982’s Night And Day was Steely Dan slick with legitimate hit singles. The Englishman’s move to New York, his attempt to be the new Cole Porter and the hunch he should record a guitar-less/keyboard focused pop album inspired Night And Day. The album has a jazzy and Latin feel, but with a punk/New Wave edge. This was a New Wave Steely Dan album – complete with the clever lyrics and a pristine studio sound (sorry for the second Steely Dan reference in as many paragraphs, but it is the most appropriate reference I can think of). I played this album until the grooves where gray. It was perfectly of the time, yet timeless. I have never tired of it. The secret ingredient is the outstanding use of percussion. I had the good fortune of seeing the tour that supported this album; it was every bit as perfect live as this album is a studio gem. 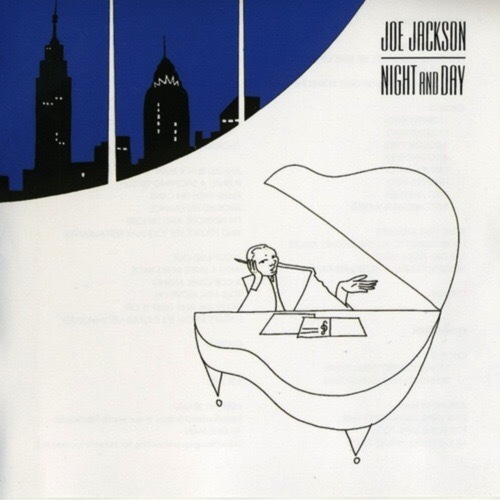 Given this was a big hit and Joe Jackson is a bit underrated compared to his contemporaries like Elvis Costello, you should be able to pick up a high quality copy of this LP for cheap (I recently picked up a pristine backup copy for a buck). That jump blues album you mention is, I think, ‘Jumpin’ Jive.’ I know about this album largely because I was in a band at the time. We had this off-the-wall bass player who wanted us to learn ‘Five Guys Named Moe’ from that album. I just laughed. We barely had the chops to get through ‘Johnny B. Goode.’ But now that you (sort of) mention it, I’m going to give both that and ‘Night and Day’ a spin.